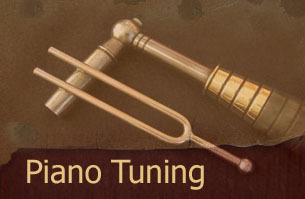 A standard piano tuning takes just over an hour. A concert piano tuning takes around two hours. If a repair is needed as well, I can usually do repairs & tuning in the same visit. When you ring me to make an appointment, please state if it is an upright or grand piano. Also I need to know the name of your piano; this is written as a decal on the fallboard. If you would like a piano tuning/ repair quote, please state your post code.